One of the most requested MATE features is the addition of a global menu applet. However, such an applet (called TopMenu) already exists, though it's not available in any PPA and that prevents many Ubuntu / Linux Mint users from installing it. 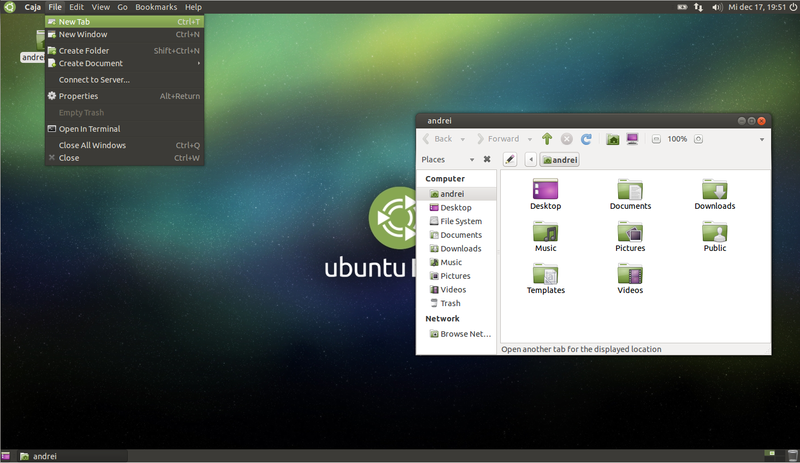 To make it easier to install, I've packed TopMenu in a PPA for Ubuntu 14.04 (requires using Ubuntu MATE or upgrading to MATE 1.8 via PPA), 15.04 and 15.10 as well as Linux Mint 17 or 17.1 (MATE edition, obviously). 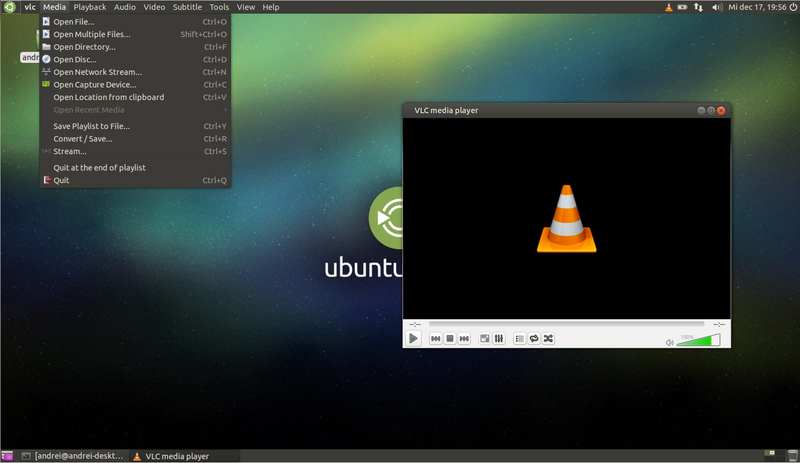 TopMenu is compatible with MATE 1.8 and 1.10 (a MATE 1.8/1.10 panel applet is shipped) and it fully supports GTK2. According to its homepage, GTK3 is partially supported (I didn't encounter any functionality issues in my test) and there are additional plugins for Qt4 and Mozilla apps (Firefox and Thunderbird). I should also mention that unlike Unity's AppMenu, TopMenu doesn't autohide and it's always visible when an application is focused. For technical information about TopMenu, see its homepage. TopMenu from our PPA only works with MATE 1.8 or 1.10 (for Ubuntu 15.10). 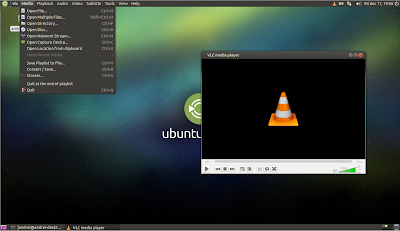 To be able to use it in Ubuntu 14.04 (if you don't use Ubuntu MATE 14.04), you'll have to install the latest MATE via PPA. Update: TopMenu is now installed by default in Ubuntu MATE 16.04. To use it, simply add it like any other applet to the MATE panel! 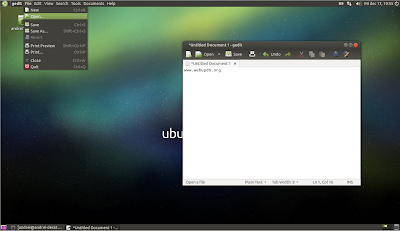 Arch Linux users can install TopMenu via AUR: for GTK2 | GTK3 | Qt (you must load it manually as explained on the TopMenu homepage). 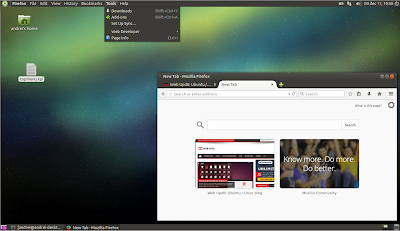 Other Linux distributions: see the instructions @ TopMenu homepage. 2. 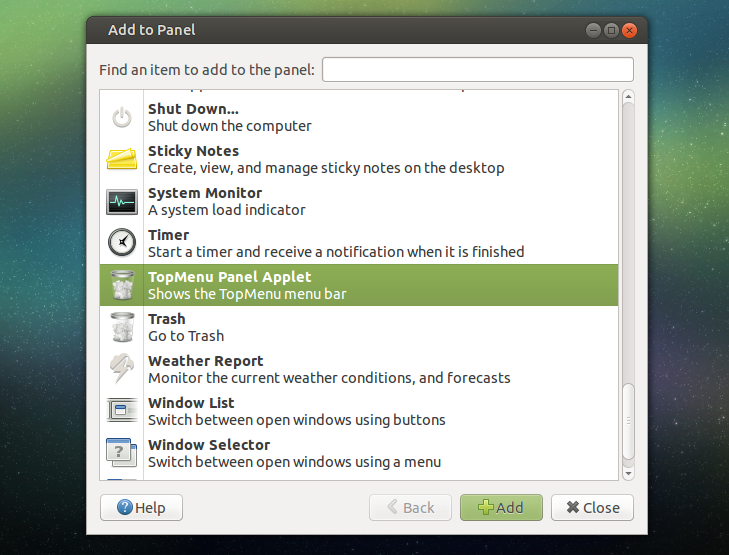 Once TopMenu has been installed, log out and log back in - this is required to load the TopMenu modules. 3. Adding the TopMenu applet to the MATE 1.8 / 1.10 panel. Before adding the TopMenu applet to the MATE panel, it's important to mention that the default MATE "Menu Bar" will stop working so instead of this applet, you'll have to use either the "Main Menu" applet or the "MATE Menu" applet. If you have the Menu Bar applet added to the panel, remove it before proceeding! Then, open some application that has a menu (try it with a GTK2 app firstly, like Caja), move the menu to the position you want it to be displayed, right click it and select "Lock to panel". If you don't do this, the TopMenu applet position will reset after a logout.